If you’ve been reading DIYP for a while now, you know that I am a fool for home made softboxes. One of the trickier parts of growing a softbox at home is the planning. The delicate work done by professionals to calculate the lengths of segments. The gentle work of trigonometry to calculate the angels. Light-less nights spent in dark basements with calipers. Once you’ve downloaded and open the excel you will see five empty yellow cells. Those are the cells you need to fill out in order to get the sizes for each.You can use Inches, Centimeters or Meters as long as you are consistent in all cells. The top two cells represent the width and length of the diffusing side of the softbox (i.e. the side that you plan to put white cloth on) – this side is also called “the big side”. You can make this side as big as the side of your board. The lower two yellow cells are for the size of the small side – this is where the flash is mounted. Lastly the bottom cell is for the flash to diffusion distance – this will be the distance that light has to travel from your flash to the middle of the diffusion screen. 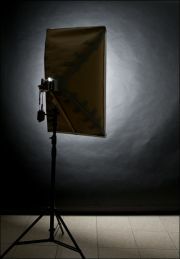 What you get in return are the angles between your base and the side of the softbox. This will allow you to draw each piece on a foamboard or plastic sheet, or wood, or any other material that you’ll be making your softbox from. If you forget any of those instructions, don’t worry – there is a great illustrated explanation inside the sheet itself. – Enter 1.5 in sotfbox depth. – I can see that the angles for the individual pieces will be 73.53 and 73.17 (I guess that for practical reasons, I’ll cut 73.5 on both). Have more tricks for building a softbox? Share them in the comments.